Mahogany is very popular wood and mostly used for furniture substrate. This wood is available in many areas so it can be sourced quite easy. The properties of wood may vary according to the region of the mahogany originated. But mahogany wood generally has the following properties: the hardness is medium, the base color is red, and the pores are small but deep with strong grain character. Mahogany wood is very popular to make indoor furniture. For outdoor furniture mahogany wood is rarely used because he is considered not strong enough. A mahogany wood has gently but very strong grain character. With the proper finishing, it can be used to make furniture product with very attractive appearance. Mahogany is also widely available in the veneer. By using veneer, then more variation can be made to create the special looked. The different character of mahogany wood is also determined by the age of mahogany tree. The old mahogany wood has very nice and strong character of grain, but it has a red dark base color and deep pores. Color variation of the wood. Mahogany wood can have color variation, from one place to another. The variation sometime is quite far, especially when we use veneer and solid wood in a furniture product. To overcome this problem and to get the same color in the final finishing color, we need to adjust the wood color in the stain application. We can use sap stain and equalizer stain to make more uniform color. Sap stain for mahogany wood is very common. It is used to bring the mahogany wood with white color go to brown color follow the darker wood. Meanwhile the equalizer stain is used to tone down the red-brown color that appear in some part in the wood. 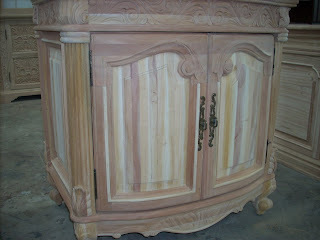 To even the color you can view in our article: how to match color in the wood furniture finishing. The old wood mahogany has a very strong grain pattern and red dark base color. With the proper finish it will give attractive looked. The red color of mahogany wood actually very nice but it will make finish color is limited to the dark brown or red. We cannot make light color with this wood. Mahogany sap wood has light color so it can be used to make lighter finish but usually the grain pattern is vague not as strong as the mahogany for old age mahogany timber. Similar case with the grains and pores, the old wood mahogany has a very strong grain character, but also has deep and small pores. The strong grain character make the old mahogany wood will create attractive and life looked with the proper finishing process. But this unique pores and grain character is easy to create bubble or pinhole in finishing, especially when the film is quite thick. A wood filler is highly recommended to make a closed pores finish to the mahogany wood. Unfortunately his pore characters make it rather difficult to be filled. We need to use the good quality filler to fill in the mahogany wood. The filler which is dry longer is works better for filling the mahogany. It is also better to use thin filler instead of thick filler to make sure the filler is come into the small pores. Some time we need to fill 2 times to ensure that the filling is done correctly. Like other wood, the character of mahogany wood is depending on how the wood was growing and life. Sometimes there is a big variation of grains and pores in the mahogany wood. It quite common when we find a mahogany wood that at one place it has very strong grains and pores, while in other parts has smooth vague grain. This is actually the uniqueness of the wood, but if the different is too far from a part to another, the product will look strange. This problem is more often when the furniture is made with combination of solid wood and veneer. The veneer usually more busy in pores and grain compare with the solid wood. We can use filler to minimize this problem. Use a light color filler to fill the pores to avoid the big pores to absorb too much stain that will resulting in dark color. Since there are many variation of grain pattern, we also need to make sure that the veneer grain is match when they area attached. The grain pattern when matching the veneer will affect the finishing look. The nice match of veneer pattern will give a nice looking furniture finishing, while the veneer setting that is not good matched will result an ugly looked. Mahogany wood is considered as a "sweet wood". Bug or turn mite likes to eat mahogany wood. There are many cases that the furniture made of mahogany wood was damage because of termite. No matter how good your furniture construction, model or looked, it will became useless if the wood is broken. To prevent this problem, the mahogany wood need to be well prepared in process production of making furniture. Usually the mahogany wood is soaked in a insecticide solution before dried and processed in a furniture factories.